An ambulance drives through traffic, siren sounding and lights flashing. The dispatcher is on the line, collecting vital information, while monitoring the status of the ambulance at the same time. What if that dispatcher could follow the live movement of the ambulance as it drives along the road, knowing it was safely and quickly arriving at the scene? This is now possible with Active Tracking. 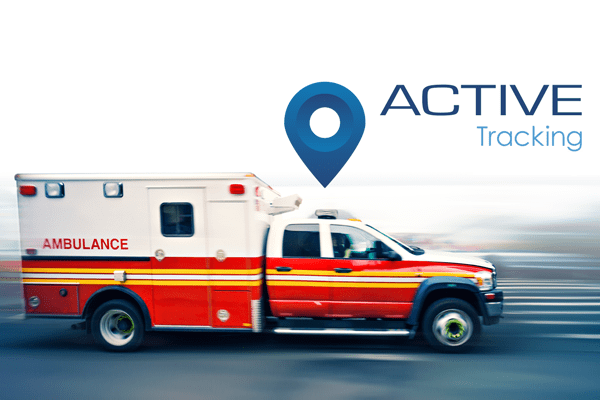 What is Active Tracking and how does it benefit emergency vehicles? Play the video to see it in action. Paramedic Services, Fire Departments, and Police are all under pressure from the public to reduce response times, while protecting the safety of pedestrians and drivers on the road. Technology plays an important role in this effort. Ideally suited for first responders, delivery and taxi fleets, and any industry in which knowing the precise vehicle position is critical, EMS GPS tracking system allows customers to view their vehicles in near real-time. For example, an ambulance dispatcher can watch the vehicle’s progress and reassure a caller that the ambulance has just turned off the highway onto their street. Another fleet dispatcher could closely monitor vehicle activity and see, at a glance, if a driver is driving too fast. Using Active Tracking is very much like watching your fleet vehicles from a traffic helicopter. Active Tracking is made possible with increased data logging frequency and animation in MyGeotab. The animation feature displays estimates of the real-time location of the vehicle onto the live map. Users are able to watch a simulated icon of the vehicle as it is moving. This new feature provides fleet managers and dispatchers with a very accurate representation of where a vehicle enabled with this technology is located at any given time. When Active Tracking is enabled, smart technology is used to request data from the Geotab GO Device at varying frequency intervals. Then, the data is relayed to servers for processing and the position of the vehicle is reflected on to the live map. When the triangle icon is shown, this means the vehicle is in motion. As the vehicle slows down or speeds up, that change is also reflected in the movement of the icon on the map. Previously, data was spooled into a buffer and then uploaded when the buffer was full. With this concept, some data could have been uploaded quite fast if the buffer was filled quickly. On the other hand, if there was less overall data coming in, it took the buffer longer to get filled and therefore the data would be received much slower. Using patented algorithms, MyGeotab presents that granular location information on an animated map, demonstrating the steady vehicle movement — instead of the jagged jumps that are seen with other telematics solutions. As a result, Geotab’s Active Tracking solution provides deep, actionable insights that are particularly useful in applications where the exact location of a vehicle for dispatch purposes is essential. Through the ProPlus Plan, you are able to activate features such as Active Tracking, third-party integrations and other special features. Active Tracking is automatically enabled for users on the ProPlus Plan. Our customers with the Pro Plan can turn on Active Tracking on the MyGeotab Vehicle Edit page (note: enabling this feature moves the device from Pro to ProPlus). Active Tracking is also required for time-sensitive server-based notifications and rules such as posted road speed warnings for the driver using GO TALK live in-vehicle verbal coaching solution. For more information on Active Tracking or to upgrade your current plan to include Active Tracking, contact our support team.